If your cat looks like she's suffering from a cold, she may actually have a case of cat flu. Learn how to spot the symptoms of this very common and contagious respiratory infection. Cat flu is the common name of a respiratory infection that affects thousands of cats every year. The illness is highly contagious and tends to thrive in places where there are large feline populations, such as rescue shelters and feral colonies. Although virtually any cat can contract flu whether it has been vaccinated or not, the disease can be especially hard on kittens and senior cats, as well as those diagnosed with feline immunodeficiency virus and feline leukemia. In all too many cases, the infection proves fatal, but many cats do manage to survive the illness and eventually recover. However, once a cat has had cat flu, it will be a carrier of the virus for the rest of its life. Cat flu is caused by several feline viruses. Certain bacteria also play a role in the onset of symptoms, as well as cause secondary "opportunistic" infections that can lead to pneumonia. Let's take a closer look at two of the most prevalent causes and the flu-like symptoms associated with them. Feline calicivirus typically causes a milder form of cat flu, but the experience is still quite unpleasant. It's more common for cats to survive this strain of respiratory infection. Feline herpesvirus causes a more serious variety of feline flu that is more apt to claim the lives of infected cats. 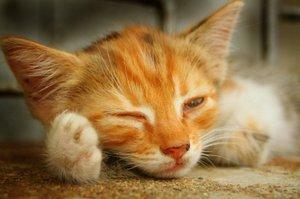 Cat flu viruses can spread like wildfire from one infected cat to the next. The virus is active in bodily fluids, especially in saliva and the discharge pouring from the eyes and nose. This means the virus is spread through direct contact as well as by indirect contact when the shed virus is deposited on food bowls, litter boxes, bedding and clothing. As mentioned previously, cats that survive a bout of feline flu almost always become carriers of the virus. Some will shed it continuously in their bodily fluids, while others only appear to shed the virus during times of stress. Occasionally, a carrier cat will display symptoms of active flu, but subsequent bouts are usually not as serious as the initial infection. Diagnosing the exact cause of feline flu involves identifying all of the symptoms and culturing the inside of the sick cat's mouth to identify which virus is the culprit. Treatment of the illness mainly consists of supportive measures since there is currently no cure for either virus. Vets usually prescribe antibiotics to fight off secondary infections that increase the viral symptoms. Vets have also noted a small amount of success in relieving symptoms with the off label use of human medications like anti-viral eye drops and the virus inhibitor Interferon. By and large, sick cats are kept warm and encouraged to take food and water. Crusty discharge is routinely cleaned away from the eyes and nose to make the patient more comfortable. In severe cases, some cats are hospitalized and administered IV fluids, and it's extremely important to isolate sick cats in order to reduce the chance of spreading the virus to other felines. In the end, it's far easier to prevent feline flu than it is to treat it. All cats should receive a series of combination vaccinations to significantly lower the risk of contracting flu viruses. Carriers should be kept isolated from other felines, and care givers should practice diligent hygiene to keep from spreading the virus on their hands and clothing.